Shirt by A.P.C., Skirts by DKNY, Cuff by ANTONINI. 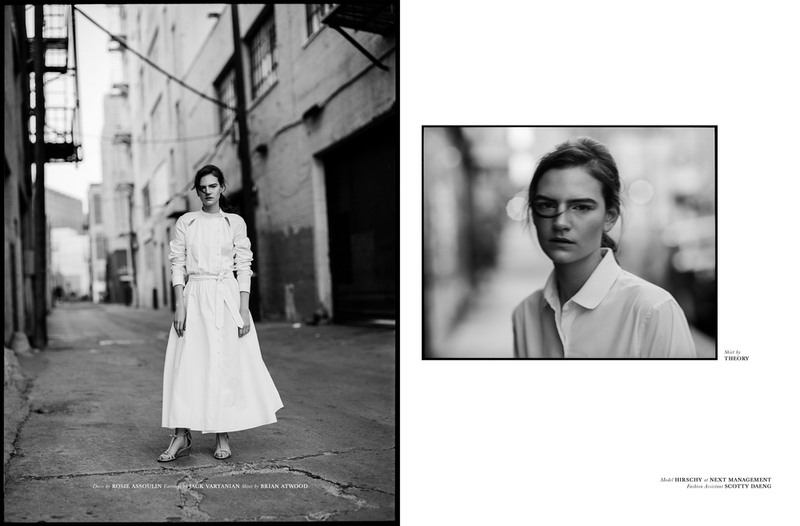 Hirschy is represented by NEXT Model Management in Paris, Los Angeles, and SUPREME in New York City. (Left) Blazer by ARMANI COLLEZIONI, Shirt by EQUIPMENT. (Right) Shirt by ROBERT RODRIGUEZ, Pants by ARMANI COLLEZIONI, Earrings by DOVES. (Right) Dress by ROSIE ASSOULIN, Earrings by JACK VARTANIAN. (Left) Top by JIL SANDER, Earring by MARLI. (Right) Shirt by ROBERT RODRIGUEZ, Pants by ARMANI COLLEZIONI, Earrings by DOVES. (Left) Dress by ROSIE ASSOULIN, Earrings by JACK VARTANIAN, Shoes by BRIAN ATWOOD.